Mobile devices are increasingly used by divers to locate the best scuba diving available. Although Miguel’s Diving has been operating for over a decade in the same pristine reefs of Gorontalo, Sulawesi, our diving guests are on the move. Smart phone use has exploded since we opened twelve years ago. So, we have launched a new web site that is compatible with mobile devices. Mobile and tablet users already account for over 30% of traffic to our home page. That percentage is projected to rise, particularly among Asian and European divers. They make up the majority of its customer base. The web site has several key features that are important to traveling divers. It focuses on the uniqueness of Gorontalo diving. Underwater landscapes are a powerful draw. Photographs on the web site clearly show the dramatic nature of diving in Gorontalo. These photos are now formatted with mobile devices in mind. Endemic and new species are another feature of Gorontalo’s marine environment. Miguel’s Diving staff discovered Salvador Dali sponges in our first year of operation. The unique, surreal carving on these sponges can only be seen along the northern coastline of Tomini Bay. Other unique marine life is highly localized. Miguel’s Diving staff knows the few locations where endemic Blue Belly Blennies live! Another clear reason to dive in Gorontalo is the variety of diving environments. Dive sites include coral walls, multiple pinnacles, mysterious caverns, submerged points, historical wrecks, muck and even an atoll. The web site organizes dive sites based on marine environment. Miguel’s Diving provides professional guides and custom-built speed boats for maximum enjoyment. The re-tooled web site also provides other links for Miguel’s Diving. Our Facebook page contains the latest news, photos and interaction with guests. Our likes exceed 11,000. 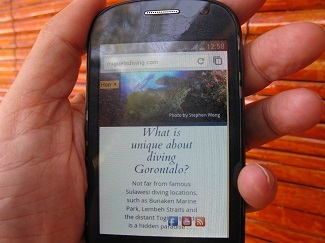 Potential guests with mobile devices can now jump to Trip Advisor postings for Miguel’s Diving Gorontalo. There is even a button to access our YouTube page. For more information, please contact us at info@miguelsdiving.com or call +62 852 4004 7027 from your mobile device.